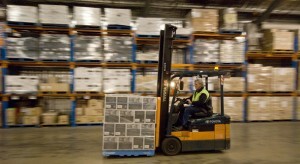 Order Picking is the productive operation in a warehouse operation. Any warehouse design exercise that doesn’t include a rigorous approach to designing the processes and equipment layout for Order Picking, is suspect. When we Order Pick we are essentially “manufacturing” what the client is going to pay us for. It’s obvious, but probably worthwhile stating that, if it takes too long the costs increase and profitability fall, if we get it wrong the client does not get what we want him to pay for. Split Case where cartons are opened and some of the contents picked and packed for despatch to the client. Split Case Order Picking is the operation where items are taken from a carton or case, in order to fulfil a client’s order. In some operations the items are unpacked and placed into tubs or bins before presentation at the pick-face to facilitate the Order Picking process, (most common in “Goods to the Man” operations). Given that in Full Case Order Picking we can take a full carton from a a pallet and place it on another, or a conveyor, to pick that portion of the clients order, and charge them for the units contained in that carton, whereas in Split Case Order Picking we must open the carton, count out the required units and repack them, charging the client for only that part of the contents of the carton, we can see that Split Case Order Picking Operations attract more costs than Full Case. Split Case Order Picking process design should concentrate on the three main ways of increasing productivity, reducing or eliminating operator travel, increasing accuracy of the picking and increasing the speed of picking. Reducing the operator travel is achieved by pick-face design, using specialised equipment, (e.g. Carton Live Storage), creating picking zones and process design. The location of SKU’s in the pick-face or slotting is important here as well, (See the “Slotting” article above). Accuracy is enhanced by pick-face design, slotting, systems such as Radio Frequency Data Terminals, Pick to Light and Pick to Voice. A properly designed order picking document can also increase the accuracy of the Order Picking operation. The speed of the picking can be enhanced by all of the above and efforts to eliminate the time wasted in finding a SKU, confirming the pick and waiting for stock need to be made. Split Case Order Picking is a complex process and the level of customer service a company delivers is dependant on it being error free and timely. The profitability of the warehousing operation can be enhanced by ensuring that the Order Picking operation is well designed and supported by the other processes.